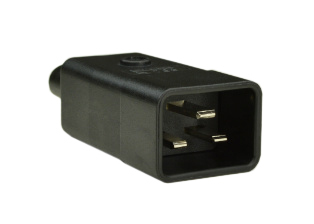 "UNIVERSAL" POWER SUPPLY CORD, IEC60320 C-20 PLUG., 15A-250V (UL/C-UL), 16A 250V (VDE), BLACK, 2.5 METERS, ROJ=2 IN. STRIP=1/4 IN. Description: "UNIVERSAL" POWER SUPPLY CORD, IEC60320 C-20 PLUG., 15A-250V (UL/C-UL), 16A 250V (VDE) SJTO, 105°C, 14/3 AWG- H05V V-F, 1.5mm2, BLACK, 2.5 METERS (8FT.-2IN.) (98"), ROJ=2 IN. STRIP=1/4 IN. 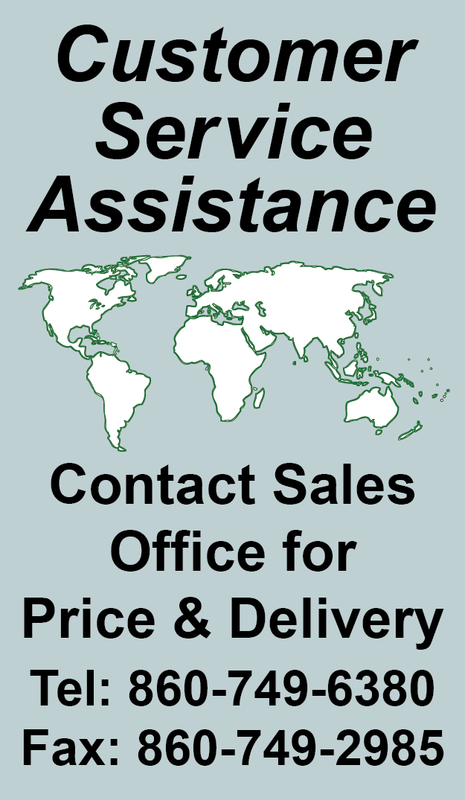 2 POLE-3 WIRE GROUNDING. 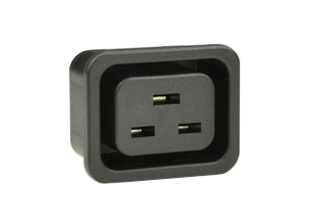 "UNIVERSAL" POWER SUPPLY CORD, IEC60320 C-20 PLUG., 15A-250V (UL/C-UL), 16A 250V (VDE), BLACK, 2.0 METERS (6FT.-7IN.) (79"), ROJ=2 IN. STRIP=1/4 IN. 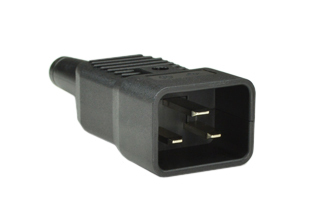 "UNIVERSAL" POWER SUPPLY CORD, IEC60320 C-20 PLUG., 15A-250V (UL/C-UL), 16A 250V (VDE), BLACK, 1.0 METERS (3FT.-3IN.) (39"), ROJ=2 IN. STRIP=1/4 IN. 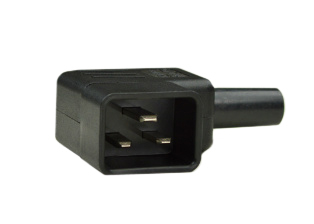 "UNIVERSAL" POWER SUPPLY CORD, IEC60320 C-20 PLUG., 15A-250V (UL/C-UL), 16A 250V (VDE), BLACK, 3.05 METERS (10 FEET) (120"), ROJ=2 IN. STRIP=1/4 IN. 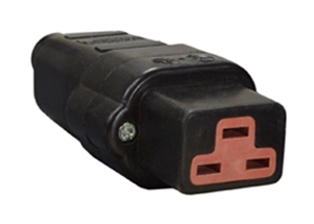 IEC 60320 C-20 STRAIGHT PLUG, 16 AMP-250 VOLT, 2 POLE-3 WIRE GROUNDING. 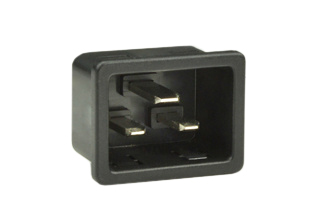 TERMINALS ACCEPT 16AWG & 14AWG CONDUCTORS, MAX∅ 14AWG (2.5mm²). INTERNAL STRAIN RELIEF ACCEPTS 10mm (0.394") DIAMETER CORD, EXTERNAL STRAIN RELIEF ACCEPTS 9mm (0.354") DIAMETER CORD. POLYAMIDE 6 (NYLON). TEMP. RATING -30°C TO +80°C. 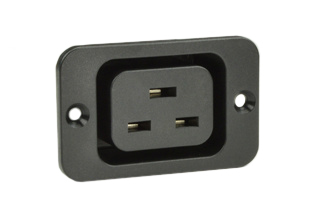 IEC 60320 C-20 RIGHT ANGLE PLUG, 16 AMP-250 VOLT, 2 POLE-3 WIRE GROUNDING. 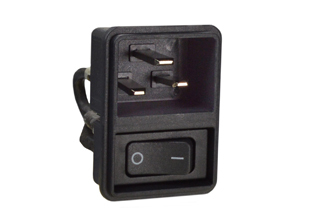 TERMINALS ACCEPT 16AWG & 14AWG CONDUCTORS, MAX∅ 14AWG (2.5mm²). INTERNAL STRAIN RELIEF ACCEPTS 10mm (0.394") DIAMETER CORD, EXTERNAL STRAIN RELIEF ACCEPTS 9mm (0.354") DIAMETER CORD. POLYAMIDE 6 (NYLON). TEMP. RATING -30°C TO +80°C. 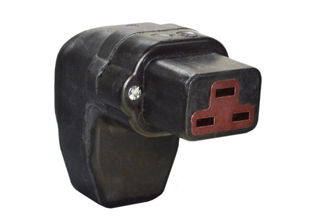 IEC 60320 C-20 LEFT ANGLE PLUG, 16 AMP-250 VOLT, 2 POLE-3 WIRE GROUNDING. 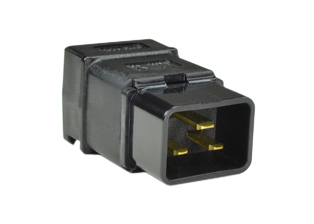 TERMINALS ACCEPT 16AWG & 14AWG CONDUCTORS, MAX∅ 14AWG (2.5mm²). INTERNAL STRAIN RELIEF ACCEPTS 10mm (0.394") DIAMETER CORD, EXTERNAL STRAIN RELIEF ACCEPTS 9mm (0.354") DIAMETER CORD. POLYAMIDE 6 (NYLON). TEMP. RATING -30°C TO +80°C. 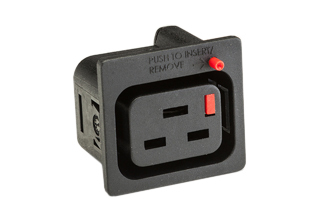 IEC 60320, C-19 OUTLET, 20A-250V (UL/CSA), 16A-250V (VDE), 6.3 mm (1/4”) QUICK CONNECT TERMINALS, BLACK. 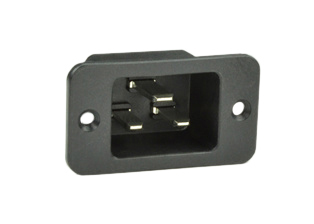 IEC 60320, C-19 OUTLET, 20A-250V (UL/CSA), 16A-250V (VDE),,VERTICAL QUICK CONNECT/ SOLDER TERMINALS 4.0 X 0.8 mm (0.157” X 0.032”). BLACK. 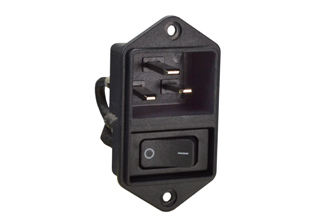 IEC 60320, C-19 OUTLET, SNAP-IN MOUNT, 21A-250V (UL/CSA), 16A-250V (VDE), 6.3 X 0.8 mm (.250” X .032”) Q.C. TERMINALS. BLACK. 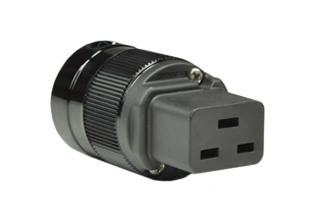 PLUG ADAPTER, DETACHABLE POWER CORD, 15A-250V, IEC 60320 C-20 PLUG, IEC 60320 C-13 CONNECTOR, 14/3 AWG SJTO 105°C, 0.6 METERS (2 FEET) (24") LONG. BLACK. 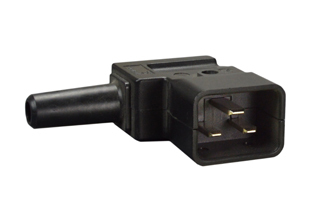 PLUG ADAPTER, DETACHABLE POWER CORD, 15A-250V, IEC 60320 C-20 PLUG, IEC 60320 C-13 CONNECTOR, 14/3 AWG SJT 105°C, 0.46 METERS (1FT.-6IN.) (18") LONG. BLACK. 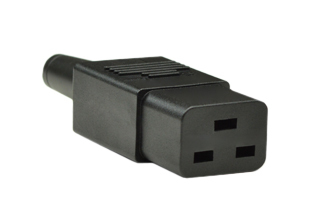 PLUG ADAPTER, DETACHABLE POWER CORD, 15A-250V, IEC 60320 C-20 PLUG, IEC 60320 C-13 CONNECTOR, 14/3 AWG SJT 105°C, 0.6 METERS (2 FEET) (24") LONG. BLACK. 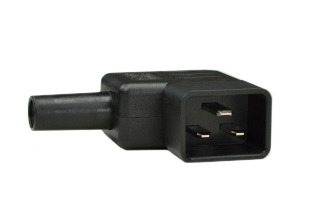 PLUG ADAPTER, DETACHABLE POWER CORD, 15A-250V, IEC 60320 C-20 PLUG, IEC 60320 C-13 CONNECTOR, 14/3 AWG SJT 105°C, 0.9 METERS (3 FEET) (36") LONG. BLACK. 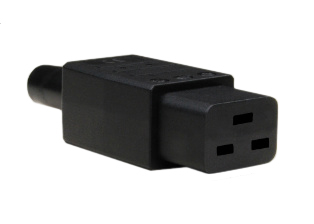 PLUG ADAPTER, DETACHABLE POWER CORD, 15A-250V, IEC 60320 C-20 PLUG, IEC 60320 C-13 CONNECTOR, 14/3 AWG SJT 105°C, 1.2 METERS (4 FEET) (48") LONG. BLACK. 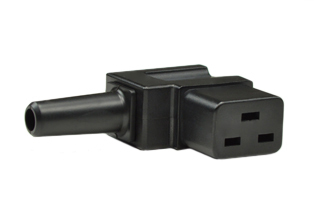 PLUG ADAPTER, DETACHABLE POWER CORD, 15A-250V, IEC 60320 C-20 PLUG, IEC 60320 C-13 CONNECTOR, 14/3 AWG SJT 105°C, 1.5 METERS (5 FEET) (60") LONG. BLACK. PLUG ADAPTER, DETACHABLE POWER CORD, 15A-250V, IEC 60320 C-20 PLUG, IEC 60320 C-13 CONNECTOR, 14/3 AWG SJT 105°C, 1.8 METERS (6 FEET) (72") LONG. BLACK. 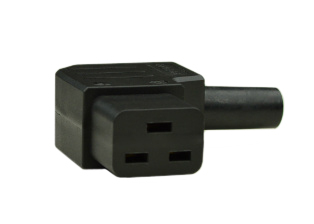 PLUG ADAPTER, DETACHABLE POWER CORD, 15A-250V, IEC 60320 C-20 PLUG, IEC 60320 C-13 CONNECTOR, 14/3 AWG SJT 105°C, 2.44 METERS (8 FEET) (96") LONG. BLACK. 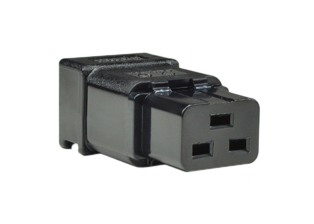 PLUG ADAPTER, DETACHABLE POWER CORD, 15A-250V, IEC 60320 C-20 PLUG, IEC 60320 C-13 CONNECTOR, 14/3 AWG SJT 105°C, 3.05 METERS (10 FEET) (120") LONG. BLACK.